We think of Chevrolets as purely American (and sometimes Canadian) cars, but just like the countless countries where the Corvette was never on the menu, there have been dozens and dozens of Chevrolets that America never received in any shape or form. Ever heard of the Chevrolet Kommando? It hasn’t heard of you either, and odds are it never even made a trip to Michigan for a family reunion to see what its siblings are up to. Here are seven Chevrolet sedans that Americans never got and have probably never seen. A true corporate “bitsa,” the Chevair combined the body and chassis of the Opel Ascona/Vauxhall Cavalier with the front fascia of an Opel Manta. The car itself used GM’s U-car platform, so a lot of these items were almost plug-and-play, thanks to built-in flexibility. 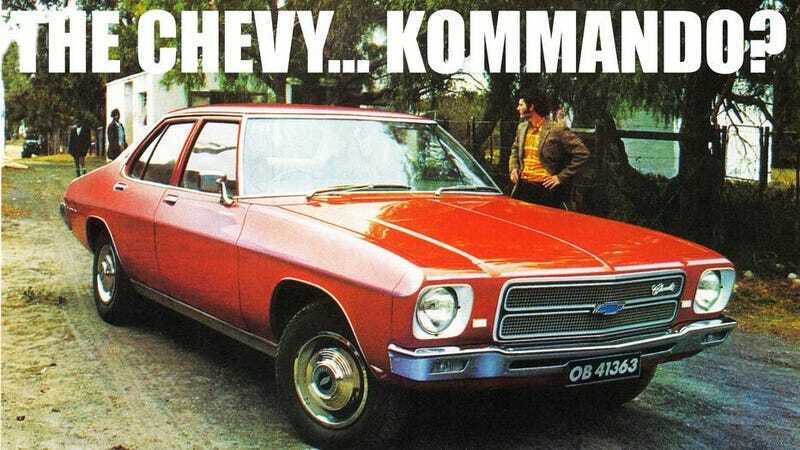 The name itself appeared to be a mix of Chevette and Corvair, for an added dash of “synergy,” or perhaps a reflection of the limited amount of time that GM of South Africa had to come up with a name for the car. The Chevair went on sale starting in 1976 and offered 2.0-liter and 2.3-liter four-cylinder engines. By the late 1970s, the Chevrolet nameplate was on its way out, so GM tried to de-emphasize the marque as it transitioned to just selling Opels as Opels to avoid the headache of selling German cars as Chevrolets. Opel’s range-topping sedan was one of numerous cars from GM’s German division that never appeared in North America in any form, parts-bin items included, but that doesn’t mean it was just confined to Europe and the British Isles. The plush Senator came to South Africa badged as a Chevrolet starting in 1978, offering a spacious cabin and European handling. While a 3.0-liter fuel-injected six-cylinder engine was the top powerplant back in Europe, the South African version used the 4,093cc Chevrolet 250 engine. The sedan would continue to be sold as a Chevrolet through the 1982 model year, when GM of South Africa switched to Opel badging to keep things simpler. After production of the Chevrolet Opala started coming to a close in Brazil, GM decided to just rebadge the new Opel Omega, instead of designing and engineering a car from scratch for the Brazilian market, while using its global bin of random parts. This approach gave Brazil, and only Brazil, the Chevrolet Omega, also known as the Opel Omega A in its home market. Brazil’s Omega had a truncated range of engines, with the 2.0-liter four-cylinder and a 3.0-liter six-cylinder on the menu. But with the end of production of the Omega A, Chevrolet of Brazil switched to older units from the Chevy Opala, modernized a bit. Can your car get through the wash?